After a week’s worth of competition with other tourists to capture the ideal photo of all the scenic sites in and around Cape Town, we decide we need a vacation from our vacation and take a day off to go to the beach. We throw the proverbial dart at the map and it lands on Camps Bay on the Atlantic side. 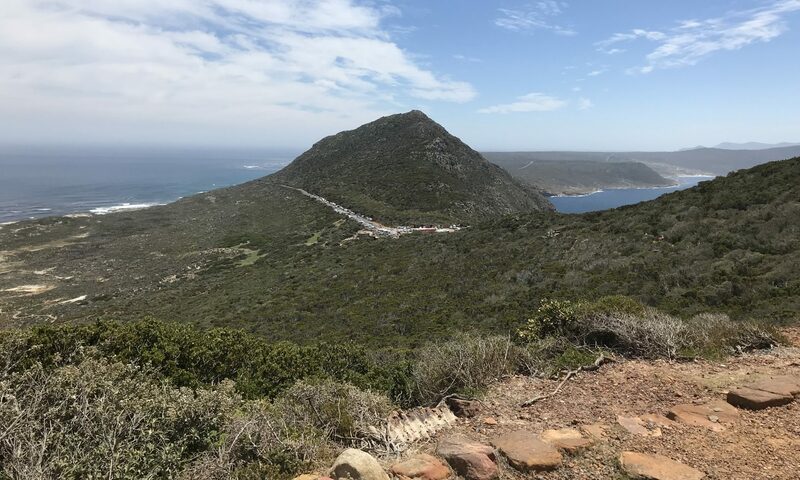 After a scenic drive on the wrong side of the road (yes, South Africans drive on the left), winding through jutted mountains that appear as though they have been carved with a giant chisel, we descend into a quaint little seaside town. It’s amazing how much coastal villages look the same throughout the world. Maybe it’s in the (salt) air. There’s always an element of kitsch, with cute little stores and shops, usually with names that are puns for something related to waves, sand, nautical terms and other maritime jargon. The “Surf’s Up” or the “Salty Dog,” for instance. We hit a bit of the morning commute traffic but eventually see the beach stretched out parallel to the main road in town. All we need to do is navigate to find a spot to park. As we slow to survey any openings, we are greeted by a man adorned in a fluorescent, lime-green nylon vest, the kind crossing guards might wear. He is directing us to a better spot just a few car lengths ahead. We are not sure if he is a city employee or just some Good Samaritan. But we follow his advice and take the slot. There are no meters and there are no signs for how long we can stay here. “I think parking is free and we probably just give him a tip to watch our car,” says Sherry, ever the astute Third World Citizen. We decide on 50 Rand, about $3.70 U.S. I hand him the bill and he is pleasantly surprised. “Thank you, boss,” he says. He assures us he will take good care of the vehicle in our absence. It is only a few steps to the beach, but before we set foot on the wide, white swath of sand, we are approached by a vendor renting umbrellas and chairs. We negotiate a price and he leads us to a spot with parasol in hand. He whistles to a colleague and signals to him to bring the chairs. In a few moments we are set up, and just in time. It is only 9:30 a.m., and even though the weather is mild and a refreshing breeze is blowing, the sun is demonstrating its UV prowess and promising more of the same as the day progresses. No sooner are we seated, when we are approached by yet another vendor. Before we can even say “No, not today,” he has laid out some art work and he is explaining the situation in each painting. He has a broad smile and a mop of dreadlocks perched on his head. He appears to be influenced by Bob Marley and within a few moments he coincidentally confirms his admiration for the late Jamaican singer-songwriter sensation. One thing we don’t need right now is a painting. We are vagabonds, traveling the world. But the guy is making jokes and is clearly having a good time just trying to sell us something. His painting technique is not all that unusual or unique, and for all we know they aren’t even his original works. But man, the guy is a good salesman. He has about 20 or 30 pieces on canvas. He rolls them out and starts describing the back story to each one. He is attentively watching our every reaction, our facial expressions, our interaction with one another. He begins to build a pile of those we have outright rejected and another pile for those we have not yet summarily dismissed. He is clearly working to close a deal and he knows the algorithm for how to get there. He shows us one of a man with two women. “He has two wives. Two wives: twice as much trouble,” he says. The lines are no doubt rehearsed but, hey, so are any stand-up comic’s. And he’s got the delivery and the timing down. “Do you know about TIA?” he inquires. We do not. “TIA is ‘This is Africa.’ We give him a quizzical glance. “If I am going to a party and I say I will be there at 8 but I don’t show up until 9, the guy will say, ‘Hey, you said 8.’ And I will say, ‘Hey, man, This is Africa!’ We don’t have hours!” His laugh is contagious. The pile of paintings is eventually narrowed down to three. There is one we both agree on, and then there is one Sherry favors and one that I kind of, sort of don’t mind. We are clearly the perfect mark. He gives us a price for the one we agree on. “Now we bargain,” he says, “like at the bazaar.” He begins to explain how bargaining works, but we make it clear we weren’t born yesterday, just maybe two days prior. So he gives us a price we cannot refuse for the three works of art, and it is then we realize we do not have enough South African Rand. He inquires whether we have any other currency. He’ll take Euros, U.S. dollars, Japanese Yen. “But not Zimbabwe dollars!” He again laughs. “Not even a million Zimbabwe dollars!” Hyperinflation in that country has rendered their currency worthless. I reveal, much to Sherry’s ever-vigilant Third-World wariness, that I do have some U.S. currency. The problem is that the smallest bill I have is a $100 denomination. “No problem,” he says. “I will take it and get change from my brother.” He points to the other side of the beach. Sherry’s look is enough for him to realize exactly how preposterous this proposal is. He offers to leave all his paintings and the 100 Rand bill he has to get the change. Sherry is still having none of it. No problem, he says; he’ll just get enough Rand from his brother and be right back. He even leaves his paintings with us in good faith. He is off in a flash and quickly returns with the change. We make the exchange. We bid adieu to our new friend. We are still smiling. But Sherry shakes her head in disbelief that we just bought the paintings and she is now worried that the other vendors on the beach will see us as easy prey. Sure enough, other vendors approach us. But they are pleasant and polite. As the beach population grows, so too do the vendors. And as the temperature rises, there are hawkers selling Coke, ice cream and cold water. Each has a distinctive sing-song advertisement for his refreshments. “Ice, ice, ice cream, cold water Coke,” sings one. “Brrr, brrr, water, coke,” says another. We make it through the rest of the day without unwittingly contributing any more Rand to the local economy. We return to the car, where our parking attendant shows us that everything is still in tact. No broken windows or scratches, he says. As we drive away, Sherry is still in disbelief that we fell for the sale pitch, but also admits that the guy was good, a far better salesman than painter, in fact. Me, I’m a bit more philosophical about the whole transaction. It’s like going to Las Vegas to gamble. If you go and know you’re going to lose but you do it just for the entertainment, then you got your money’s worth. We got our money’s worth. This is a story about a Garden of Eden run by a supreme ruler. It also involves a forbidden fruit. This tale is a bit more recent than the biblical version. And it has a happier ending. The year was 1981. The Cold War was raging. A man by the name of Albert Rene was running a tiny nation called the Seychelles, an archipelago of 115 separate islands scattered in the Indian Ocean, just below the equator. It is a beautiful place, maybe one of the most idyllic I have had the good fortune to visit. The islands are unique in that they are carved out of granite. The only ones in the world. Where other islands are borne of volcanic lava or from coral reefs, these came to life as remnants of a great continental split of a land mass known as Gondwana that was an aggregate of what is now Africa, South America, Australia and India. About 140 millions years ago (give or take a few months), things started splitting apart. India did a 90-degree turn, headed northeast and eventually crashed into Asia with enough force to create the Himalayas. Remnants of India were littered (and maybe loitered?) in the Indian Ocean of today to become the Seychelles. They couldn’t have picked a better place. Temperatures in the region — on both land and in the sea — hover around the 80-degree mark Fahrenheit, all year long. Unlike other tropical paradises, it is free from typhoons, cyclones and other stormy phenomena. Now, back (or maybe ahead, geologically speaking) to the Cold War days. The United States, which had a satellite tracking station on the island of Mahe, the main island in the Seychelles, apparently wasn’t too fond of Rene, a benign dictator who favored socialism. The U.S. government, always interested in protecting its property and often all too eager to conflate social democracy with outright communism to justify its interests, decided Rene had to go. And so, with the help of the United Kingdom and South Africa, the U.S. put together a rag tag team of mercenaries to oust the Seychellois leader. The plan was simple. The mercenaries would pose as some sort of fraternal organization out on a goodwill tour. They would be bringing gifts for the little Seychellois children. In the bottom of their bags would be gifts of another kind: Kalishnikov automatics and other weaponry. Getting through customs would be a breeze. Then they would wait a day or two and take over the key government buildings, the airport and the radio station to announce the coup d’etat. They aspired to use as little force as necessary and figured that would not be a problem, given the meager defenses in the country. But they would be armed and would do what was necessary, even if that meant lethal force, including assassinating Rene. Lychees are an Asian delicacy that are part of the soapberry family of fruits, which includes Longans. These fleshy morsels are about the size of a walnut. They have a rather hard, spiky shell that, when peeled, reveals a fleshy texture that tastes, to me anyway, like a cross between a peach and pear. The flesh hugs a pitted seed like a peach, too. One of the mercenaries, the story goes, was very fond of lychees. He had a bag of them on the commercial flight that he was taking into Mahe. He was advised — strongly — that he should not attempt to bring the fruit through customs. The Seychellois culture, like many tropical island paradises, is somewhat laissez-faire about a lot of rules and regulations, but when it comes to protecting its indigenous flora and fauna, it is a zero-tolerance kind of place. Apparently, the mercenary really, really liked this fruit. And so he went rogue (a rogue mercenary is an oxymoron if ever there was one). He was caught at customs. And once the customs officer discovered the fruit, he decided to do a more thorough examination of the soldier’s belongings. It didn’t take long for the customs agent to find the AK-47 hidden in the bottom of the bag of toys. Ironically, the agent didn’t know it was an automatic weapon. He thought it was something worse: a spear-gun. If the agent didn’t like the fruit, he was apoplectic about an illegal fishing device. Flora and fauna first. The mercenary panicked, grabbed the weapon and — as they say — shots were fired. It was mayhem for a few days. Some of soldiers managed to escape by hijacking a commercial jet to South Africa. Others were caught and imprisoned. For those incarcerated, it was not a pleasant time. They were beaten and tortured for months and then put on trial. They were convicted, and sentenced to death. The story got out and became something of an international sensation. Then, one day, the prisoners were summoned and sent to a rather grand home in the hills of Mahe. There, they were greeted by none other than President Rene. They figured this was the last gesture before execution, but they were (no doubt, pleasantly) surprised to learn they were wrong. Rene told them he was commuting their sentences. He didn’t need the bad publicity. They were to serve out some time on a remote island — under much more gentile conditions — until the story subsided. Then they would be released. Before sending them to the island, though, Rene delivered a little lecture to the soldiers, explaining the difference between socialism and communism, and providing examples of the work he and his government had done in building schools, hospitals and roads and bridges. Rene ruled the Seychelles until 2004. It has been one of the fastest growing countries in the Indian Ocean and African regions. He did build a solid infrastructure of schools, hospitals and government programs for the people of the Seychelles. How benign a dictator he actually was is open to interpretation. There are allegations of civil rights abuses. Rene died this week after a long career in shaping his country’s future. Things might have turned out quite differently, had it not been for that little piece of forbidden fruit.